The inferior alveolar nerve transmits the sensitivity of the lower teeth, inner gingiva of the mandible, lower lip, and chin. Its injury can lead to anaesthesia of these structures, such as that typically experienced by patients for a limited amount of time in cases of a local anaesthetic injection made by the dentist in daily practice. Anaesthesia of the lower lip arising as a result of oral surgery/practice is generally poorly tolerated by patients. The most frequent causes of nerve injuries include wisdom tooth extraction, dental implant placement, block anaesthesia, and contact of endodontic materials with the nerve following root canal therapy of a tooth. Generally, the nerve is able to “self-heal” to some degree because its fibres grow within the bone canal after a lesion. In such cases, it is not necessary to intervene surgically and functional recovery occurs within 6-12 months, though, generally, incompletely. 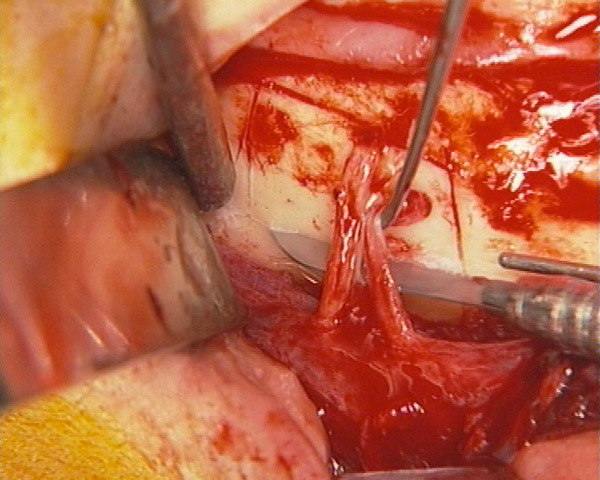 Reconstructive microsurgery of the nerve is indicated in cases with the onset of chronic pain, annoying dysaesthesia (impaired sensation), or where no spontaneous recovery occurs within 6 months. Surgery is performed intraorally by removing, temporarily, a bony window of the jaw to fix the nerve under microscope magnification. Sometimes, a portion of the alveolar nerve must be replaced with a tract of a substitute nerve (generally, the suralis nerve or the great auricular nerve). A specific instrumental examination, the so-called trigeminal sensitivity test, is essential in determining the neurological damage and grading it. In the test, a neurologist administers a slight electrical signal to the anaesthetised region and records the inhibitory reflex of the masseter muscle (this part of the exam resembles an electromyography). The injured side will require a much higher electrical stimulus to register a reflex or will not have one at all. The inferior alveolar nerve, also called the mandibular nerve, is a sensitive branch of the third division of the trigeminal nerve. Its lesion can give rise to changes in sensory function (dysaesthesia) that may be classified as an absolute lack of sensitivity (anaesthesia), reduced sensitivity (hypoaesthesia), or a pathological increase in sensitivity (hyperaesthesia). In total, 15-20% of patients may feel pain, a much worse situation than a loss of sensitivity. Such pain may be subdivided into painful anaesthesia (spontaneous pain with a feeling of “phantom limb” in the area of the injured nerve), hyperalgesia (a painful feeling in response to even a light-touch stimulus), hyperpathia (a pain sensation that is delayed in response to a pressure stimulus), and sympathetic-mediated pain (pain maintained by sympathetic tone, in response to cold or emotional contexts and alleviated by α adrenergic inhibitors). The inferior alveolar nerve is most often at risk of a lesion because of wisdom tooth extraction (0.4 25% of cases) and the placement of dental implants in the posterior part of the mandible (0-2% of cases). During the manoeuvres required in complex tooth extractions, dislocation of the roots can cause compression of the nerve. If the roots are removed completely during surgery, the recovery prognosis is generally positive. 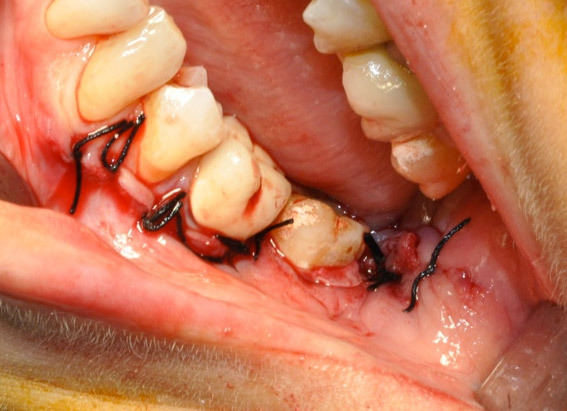 Sometimes, however, occupation of the nerve canal by spread roots can cause permanent damage; in such cases, their surgical removal is essential. Compressive damage can also occur when dissectors or retractors are used to hold the nerve away from the dental alveolus. Typically, functional recovery is good, varying in duration from a few weeks to as long as 3-4 months. Most cases of nerve severing during implant placement are due to the contact with a rotating bur. Not surprisingly, this can severely damage the nerve! Consequently, in cases of injury during the positioning of an implant, lifting or removal of the implant itself after a few days from the detrimental event does not constitute removal of the cause of the nerve damage. 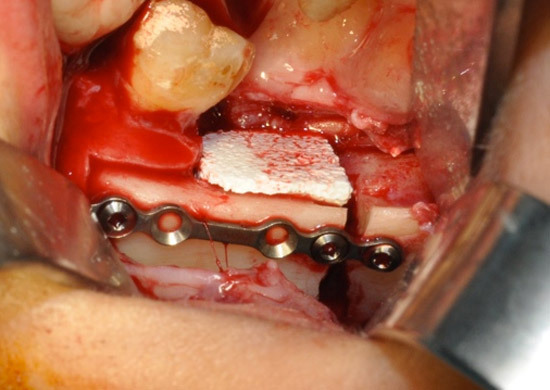 The lesion, in fact, is not typically due to compression by the implant. Its removal, the correct procedure, is performed, rather, with the intention of facilitating nerve healing within the mandibular canal. This should serve as a guide for the regeneration of the nerve in its interior. Although spontaneous nerve recovery is generally good, it is never complete. This reparative mechanism does not occur in the presence of a foreign body in the channel, such as a dental root, a bony spicule, or an implant (which is why it is valuable to remove it in case its location is in the channel). 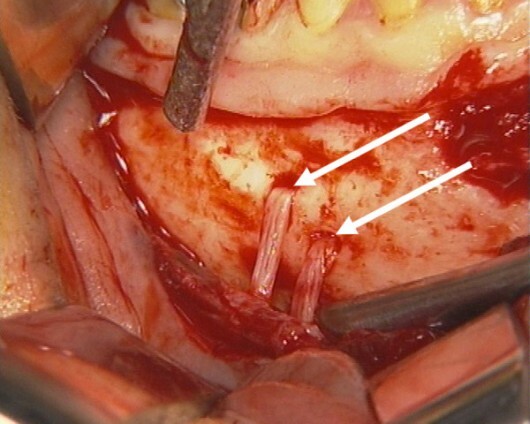 Rarely, the lesioned channel can be occupied by newly formed bone as a result of some blood in its interior at the time of surgery and this obviously hinders spontaneous regeneration of the nerve. Symptoms typically consist initially of lip and chin anaesthesia; the area reduces in size within the first 12 months, reaching a few centimetres. Thus, the initial damage is greater and may affect speech partially and lead to loss of fluids from the mouth, because the lip is not sensitive. After the self-healing process, discomfort is reduced but may remain primarily psychological. In fact, the patient is typically disturbed by the inconvenience of losing some of the fine sensitivity of the lip. 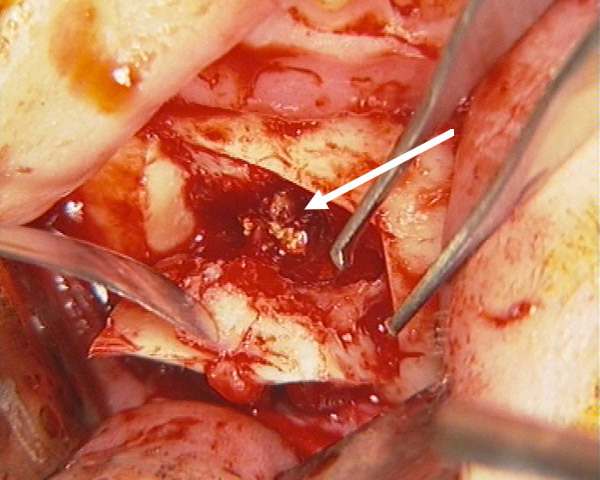 If the discomfort with the residual damage in sensitivity is not acceptable, it may be possible to improve the situation with microsurgery, by connecting the injured nerve to a tiny branch of the contralateral mental nerve. The permanent loss of vitality of the dental elements from the side of the lesion is almost invariable. There are other potentially hazardous actions to the nerve, such as the removal of cystic lesions, the treatment of apical granulomas, and complex teeth extractions. In sum, any surgical procedure near the course of the inferior alveolar nerve can lead to its injury. Extravasation of endodontic material into the mandibular canal can cause damage to the inferior alveolar nerve by ‘burning’ it. Common symptoms other than lip and chin anaesthesia are dysaesthesia and pain. 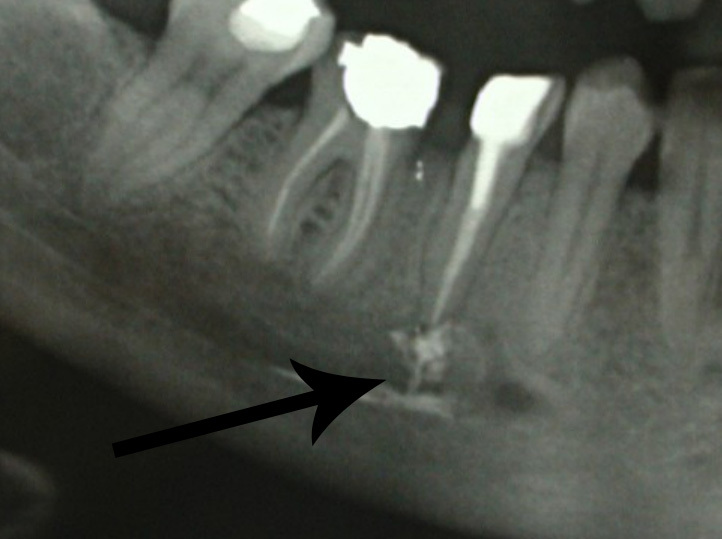 The injury mechanism is irritation or burning due to chemical contact between the endodontic material and the nerve. That differs significantly from sectioning, tearing, or compressing the nerve because of a surgical lesion. Among those cases, as described previously, anaesthesia and hypoaesthesia are the symptoms in 80-85% of cases, with pain representing the rest. In cases of a disturbance caused by an endodontic material in contact with the alveolar nerve, the prevailing symptom is pain. 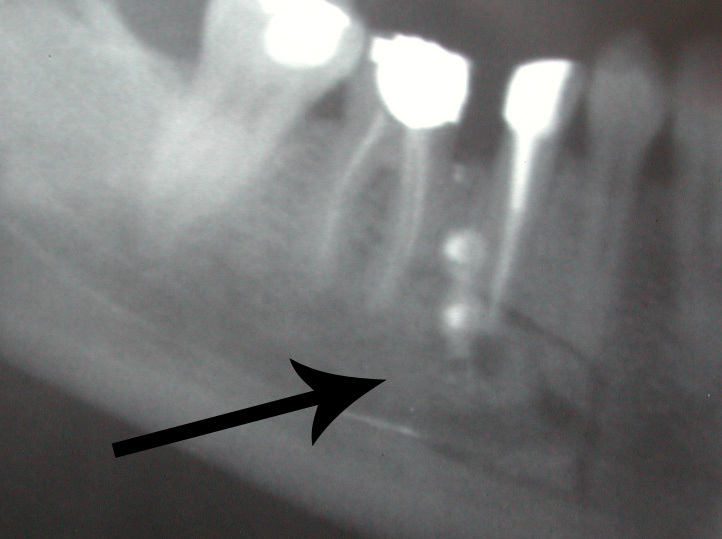 Endodontic material beyond the apex generally remains in the bone periapically, with asymptomatic bone irritation. However, if the material is pushed into the mandibular canal, because of the close relationship between the nerve and the tooth apex, this may lead to neural damage. Injections to provide nerve block anaesthesia in the lower alveolar nerve can lead to injury of both the inferior alveolar nerve and the lingual nerve. Generally, such lesions are not painful and spontaneous recovery occurs within 1 year. If recovery does not occur, a microsurgical intervention may be indicated. In cases where pain is the main symptom, the deterioration in the quality of life can be dramatic. The pain level is often high and constant, and the patient is typically motivated to seek surgical treatment to try to address the problem. It important, then, to take immediate action, because the results are usually very good once surgery is undertaken. Surgery may be effective even long-time after the nerve trauma but percentages of success decrease. 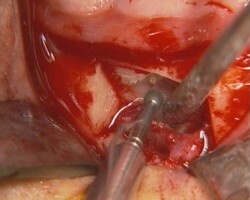 Microsurgical reconstruction of the inferior alveolar requires general anaesthesia; a nerve graft is also typically required. When surgery is not the treatment of choice, drug therapy plus psychological support should be considered. Neurotmesis is characterised by a complete section of the nerve. The consequences are the complete loss of sensitivity, accompanied or not by spontaneous painful sensations. Limited partial recovery may occur because of partial innervation in the anaesthetic area by adjacent nerves. 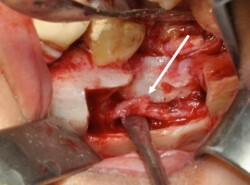 Inferior alveolar nerve injury may occur in the execution of nerve-block anaesthesia. It is apparent how a needle can cross the course of the nerve. 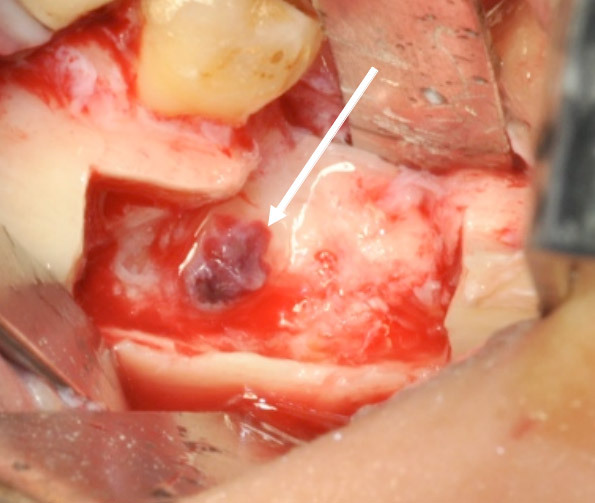 Lesion of the lower alveolar nerve caused by contact with endodontic material overflowing into the mandibular canal. The unusual finding of a double mental foramen through which the mental nerve exited the mandible, providing sensitivity to the lower lip. 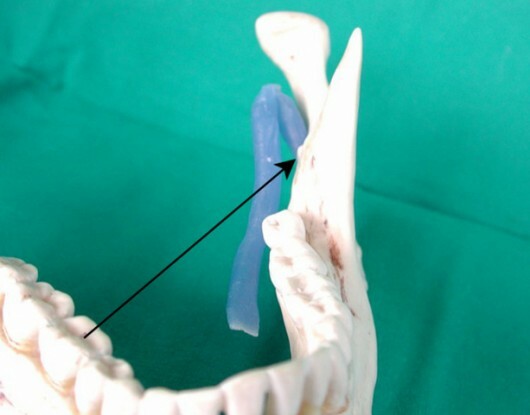 A bony window was made to access the mandibular canal using a thin, reciprocating saw. Tilting of the bony window allows highlighting of the inferior alveolar nerve (arrow), damaged by the endodontic material. The endodontic material was removed with a diamond burr. 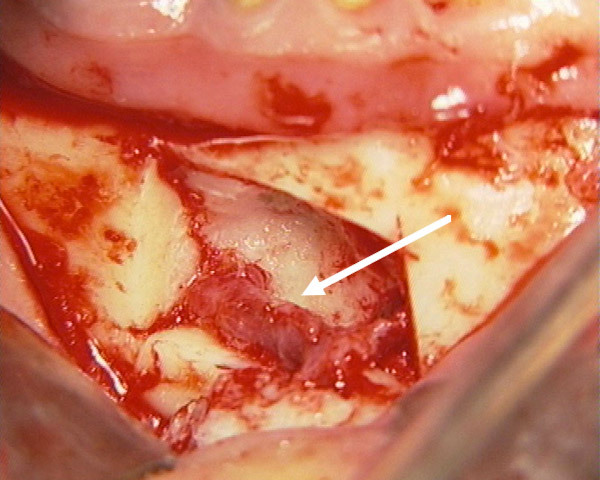 The intact inferior alveolar nerve (arrow) at the end of endodontic material removal. 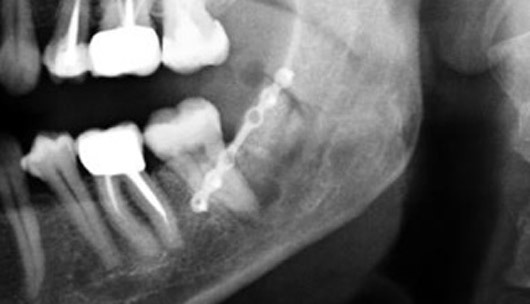 A panorex X-ray of the mandible immediately after surgery; the patient’s pain was resolved. Lesion of the inferior alveolar nerve after wisdom tooth extraction. Note the thin bony septum (red arrow) separating the alveolus (seat of the tooth in the bone). A few millimetres behind (blue arrows), the destruction of the septum is evident, explaining the nerve damage. 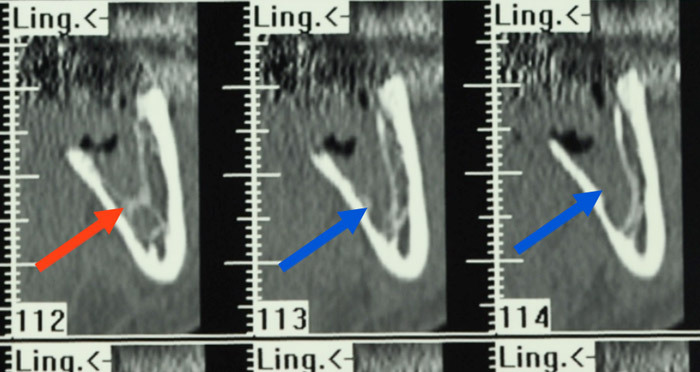 The point of the lesion of the inferior alveolar nerve is highlighted by the arrow after removal of the upper bone. The nerve lesion (arrow) is more evident after removal of the surrounding bone. The nerve will later be smoothed under microscope visual control. The bone surgical site reconstituted at the end of the microsurgical step. Panorex X-ray of the mandible immediately after surgery.